Display bold flowers in your yard or home with this Ancient Graffiti Flamed Copper Colored Calla Lilies and Bells Decorative Hanging Chain. This hardy, all metal accent brings the iconic flower of spring into your home or yard in moments, along with gentle ringing from the bells on the piece. Each recognizable, lily shaped ornament sports two extended tendrils, as well as a heart-shaped top and tapered body. A bit of chain hangs beneath each flower shape, connecting it to one of the metal rings which holds a bell. The repeating pattern adds a cohesive look to this unit, and the brown hues mesh with the outdoors easily. 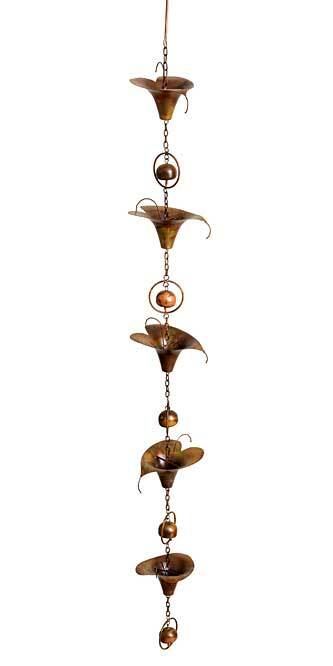 The bells chime gently in the wind, or provide relaxing sound in your home. A top hook makes it easy to place this item on a branch or other bracket, and the metal construction offers durability. Enjoy lasting blooms in your garden or home with this Flamed Copper Colored Calla Lilies and Bells Decorative Hanging Chain.